This week in whisk(e)y #22 - New Japanese Whisky, Bunnahabhain's new "boat whisky", Fred Noe in Australia, Tiki whiskey cocktails, Whisky Mooncakes and more! 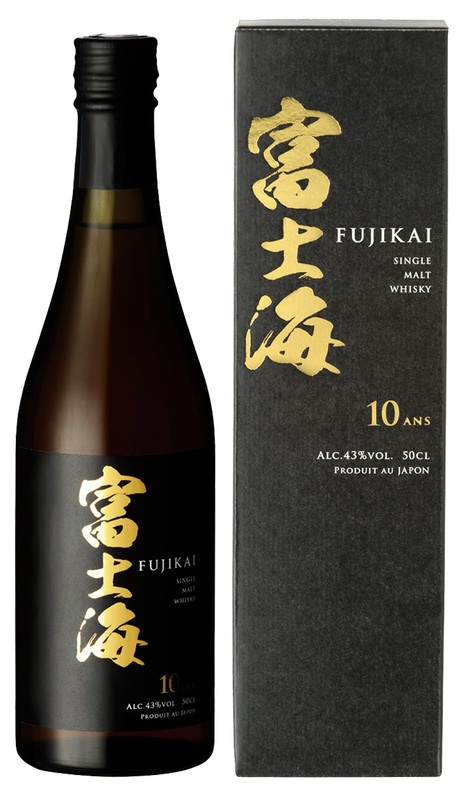 All the way from French distributor Les Whiskies du Monde (@whiskiesdumonde) comes news of a "new" Japanese Single Malt. We say "new" because it's not like this whisky was created yesterday (it is 10 years old after all), but is from a distillery that previously very few would have heard of - Monde Shuzo Distillery, at the foot of Mount Fuji. Fujikai is considered a "Ji-Whisky" or "craft whisky", which given the current popularity of Japanese whisky, we'll be very surprised if we don't hear a lot more of in the coming years (we've already heard of another Japanese craft whisky distillery in the last month, though unlike that one, Monde Shuzo has been distilling since 1952). We're certainly seeing some interesting takes on whisky maturation of late. From Ardbeg (and more recently Suntory) ageing whisky in space, to whiskies aged with music, to Jefferson's Bourbon aged at sea - these whiskies add a different element to the category, and bring a fresh, interesting new take. Adding to the mix now is Bunnahabhain (aka "Bunna") who have just announced "Hogshead 733", a whisky to be finished in casks made from a fishing boat currently embarking on a 733 mile journey. Such an experiment could really only be undertaken by an Islay distillery, and we think it's quite fitting that Bunnahabhain, with their typically unpeated style (allowing the influence of the sea-soaked cask to shine through, we hope), be the ones to do it. We're very interested to try the resulting whisky, whenever it becomes available. "Bunnahabhain Islay Single Malt Scotch Whisky announces Hogshead 733 – a collaboration with contemporary artists Maxime Berthou and Mark Požlep to produce the first ever whisky finished in casks made from a former fishing boat. The two men have embarked on an epic 733 mile sailing quest which will see them battle the high seas from Trebeurden in Brittany, France, all the way to Bunnahabhain Distillery in Islay. 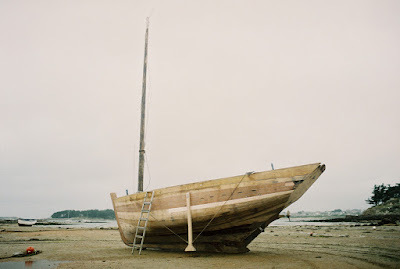 Inspired by adventure, craftsmanship and love of whisky, Maxime and Mark have spent the last two years painstakingly restoring a wooden, Brittany fishing vessel from 1941 back to its former glory. Bunnahabhain is steeped in seafaring history, with the whisky’s iconic Helmsman and his maritime stories having inspired the brand for generations. Set to arrive in Islay at the end of September, the journey will not stop there. Soaked with adventures and the salty sea water, the oak boat will be dismantled and carefully crafted into handmade whisky casks. The casks will be filled with Bunnahabhain and the precious spirit will then be finished in the casks before being bottled and sold. Maxime Berthou said: "The inspiration for this project stems from the human longing for new discoveries and nostalgia for traditional, handmade craftsmanship, something we've moved away from in today's modern society. “For Mark and me, this is a journey about transformation, adventure, passion, labour and whisky. It has taken us two years to get to this stage and we are excited to finally be on our way to Bunnahabhain." 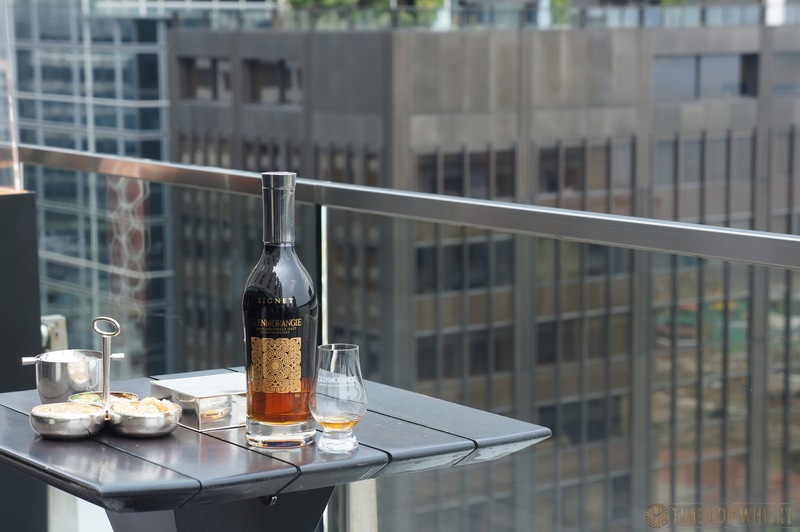 Music and whisky has always been a great match, and MHDHK have embraced hat with a series of 3 upcoming concerns in Hong Kong. "The Singleton Single Malt Whisky is proud to announce the launch of The Singleton Discovery Series, a program of world class live music, showcasing some of the world’s most extraordinary artists. Curated and produced in conjunction with House of Mercury, the Discovery Series will shine a spotlight on musical greatness - acclaimed, and in the making. Hosted in the uniquely intimate setting of OVOLO Southside’s G.I.G. space (update: Now Loft 22 in California Tower, LKF), the inaugural autumn program showcases an eclectic cross section of Grammy-nominated neo soul, alternative rock, electronic indie and Mississippi blues, courtesy of award-winning international talent from across the globe. “Our whisky is a true pleasure to discover,” said Drew Mills, Marketing Director of The Singleton in Hong Kong. ”By presenting this unique music program, we are offering a marvelous opportunity for Hong Kong to savour our world class single malt whisky, alongside truly incredible music. Each show in the series is set to be an extraordinary holistic evening of discovery. "Jim Beam Bourbon is making history by bringing all three of these passions together in Penrith this September with its very own Big Aussie Barbie. Jim Beam’s seventh generation Master Distiller, Fred Noe, known for crafting the world’s number one bourbon, is coming to Australia and will cook up a mean barbecue in support of the Prostate Cancer Foundation of Australia (PCFA) at Penrith Panthers’ Pepper Stadium on Saturday, 5 September. Ben Andrews, Marketing Manager at Jim Beam says the company is excited to be partnering with PCFA to raise awareness of prostate cancer in Australia. “Our intention by supporting PCFA is to help take the Big Aussie Barbie initiative to new levels this year and encourage more men and women to be aware of the effects and incidence of prostate cancer. As well as driving awareness through our on-pack promotion, we will be supporting all PCFA events nationally and hosting our own Big Aussie Barbie,” said Andrews. PCFA’s Big Aussie Barbie campaign encourages Australians to turn their everyday barbecues into fundraising events in support of the organisation’s work. In addition to supporting the PCFA events and hosting its own Barbie, through the GIVE BACK WITH JIM BEAM BLACK initiative, Jim Beam will donate one dollar for every PCFA co-branded Jim Beam Black 700ml bottle and 10-pack sold throughout Australia, aiming to contribute $125,000 to the cause. 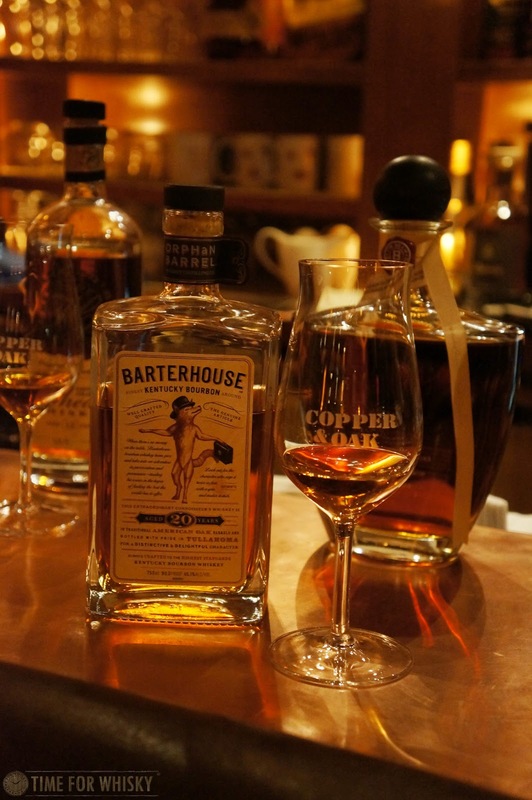 Australia and the United States are the two biggest bourbon markets in the world and them coming together over a barbie to raise money for Prostate Cancer is an initiative worth celebrating. In a recent consumer study, more than two thirds of Jim Beam Black drinkers believe “helping others is an important part of who I am” so Jim Beam found it to be a natural partnership. Fred and the Jim Beam team will be at the Pepper Stadium, Western Bar from 4.30pm to 6.30pm following the Penrith Panthers’ final home game on Saturday, 5 September. Then, after a few snags, they will move on to Panthers Leagues Club where the party will continue with drinks specials on Jim Beam Black, and Fred will host a Jim Beam Raffle with all proceeds going to PCFA. 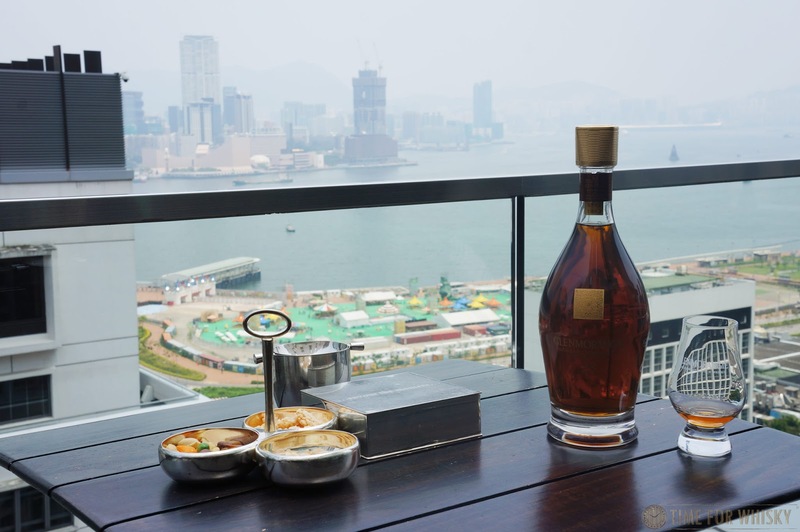 Restaurant and Bar Show HK (with whom we're Media Partners) is coming up, and to whet your whisky thirst, Telford have announced a pop-up whisky bar with a series of master-classes and tastings. Telford will also have daily Jack Daniels cocktails on offer, so drop by on any day and say hi. 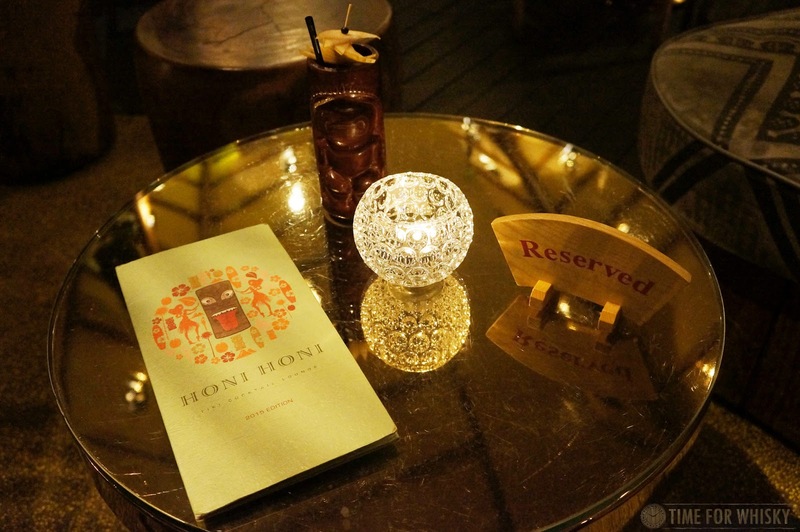 Honi Honi, Hong Kong's most famous Tiki bar might serve primarily rum-based drinks (it is a Tiki bar, after all), but who's to say you can't make a Tiki cocktail with whiskey? Tokerao is a mix of Michter's Rye Whiskey, Green Chartreuse, Cartron Caramel Liqueur, Cartron Poire Williams Liqueur, Pear Pureé, Apple Juice, Lemon Juice and Star Anise. Bounty Hunder sees Michter's Bourbon mixed with Baileys, Coconut Milk, Aztec Chocolate Bitters and Coconut Syrup. Mid-Autum Festival is almost upon us, and that means...Mooncake time (for those unfamiliar with these bakery items, see here). There's a 20% discount if you order by today, which we're going to go and do now! Tonight we attended Bonhams Hong Kong's latest Whisky auction which, in addition to having a full set of Ichiro's Malt "Cards" series (all 54 "cards", including the incredibly rare Monochrome Joker), also featured more Karuizawa than we've seen in a single auction ever. I went along not planning to buy anything (I did register, just in case), but more out of curiosity and to get a feel for the market. Having attended a few Spink auctions in Hong Kong, I knew that there were a lot of crazy prices being asked for whisky (in particular, Japanese whisky), but it didn't always seem those prices were being achieved. I wondered if the Japanese whisky market had hit its peak. Well if tonight's auction was anything to go by - it most certainly had not. Single cask Karuizawas (always a hit) consistently smashed their estimates, often going for 30-50% above their upper estimate. Hanyus and other single cask Japanese whiskies were similarly fetching far more than the higher estimates set in the catalogue. It was not uncommon to see a 30+ year old single cask 'zawa fetch $75,000 to $110,000 HKD ($13,500 to $20,000 AUD). You almost got the sense that even the auctioneer (a consummate professional, we should add), couldn't believe his luck, but was loving it regardless. Certainly some of the audience (both online and in the room) were slightly in awe. Is it investors looking to move their money somewhere other than the Chinese stock market? 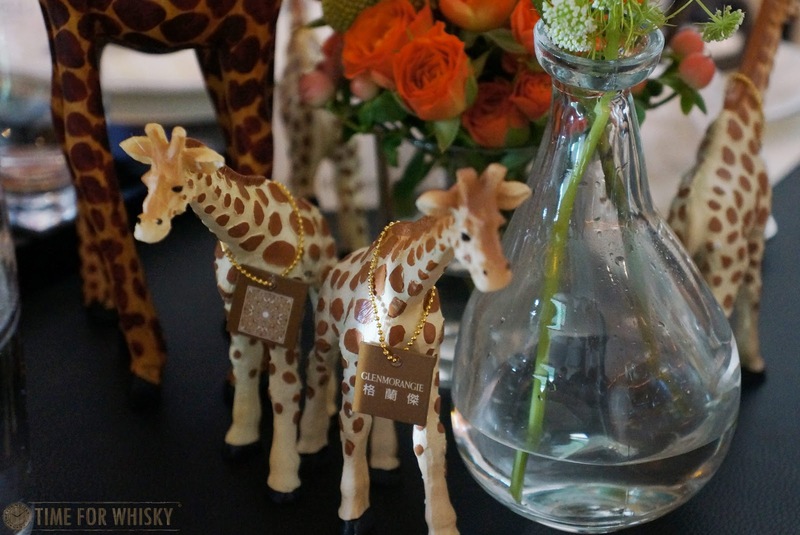 An insatiable love of whisky (we doubt it), or something else? 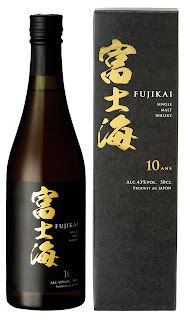 Who knows, but it seems the popularity of Japanese whisky on the auction circuit just keeps rising and rising (for now). Even whiskies from current distilleries performed incredibly well. The small parcel of Scotch on offer, mostly made up of Macallan but with a few interesting Bowmores, Laphroaigs and others, did reasonably well too, although as seems to be the case often in these auctions, there wasn't a lot of interest in the Glenfiddichs. 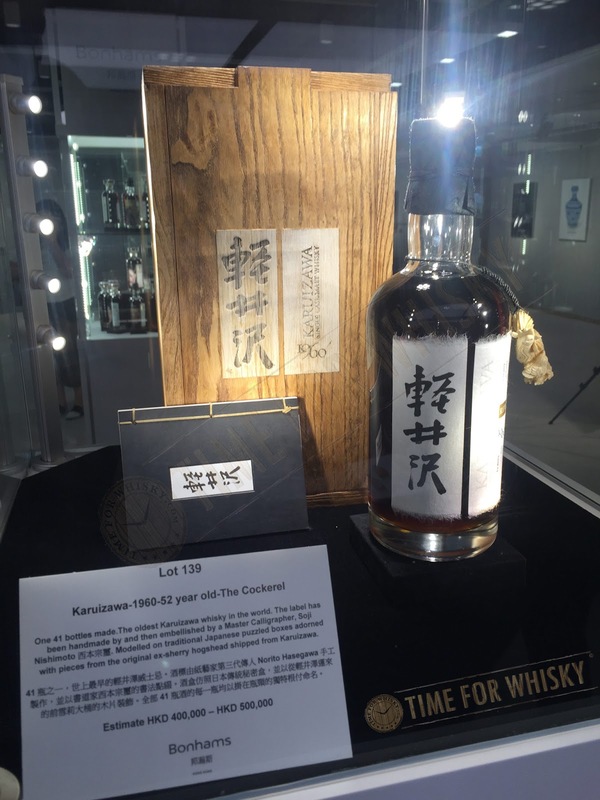 Karuizawa 1960 52 year old ("The Cockerel"), which sold for $918,750 HKD (inc. premium). For our Aussie readers, that's $165,000AUD. For one bottle of (admittedly very rare) whisky. Hanyu Ichiro's Full Cards Series (54 bottles), which sold for $3,797,500 HKD (inc. premium). In AUD? $685,000AUD. You can see a video of the Karuizawa's winning bid over on our Facebook page (and give us a "Like" while you're at it). Choo choo, or bubble bubble? Only time will tell. PS: Whether or not buyers are buying to drink or invest, we have to commend Bonhams for their whisky selection offered to all attendees, which included a mix of Japanese, Taiwanese, Scotch, blends, malts and even some IBs. 15 whiskies were on offer and (along with the generous food) made staying through the long proceedings just that little bit better. Ask anyone who's met "Dr Bill" Lumsden before (even Hendy who attended the Tùsail dinner in Sydney earlier this year) and they'll tell you he's one of the funniest, nicest, down-to-earth whisky blokes you could ever meet. Knowledgable as anything, witty, friendly and always quick with an interesting story. Luckily, I had the opportunity to meet Dr Bill at a tasting lunch in Hong Kong this week, and I can confirm they're 100% right. Dr Bill's business card reads "Director of Distilling, Whisky Creation & Whisky Stocks", but he's more commonly known as the man behind the modern day successes of both Ardbeg and Glenmorangie, a pioneer of wood finishing, and a man who takes a highly scientific approach (putting his PHD to good use) when it comes to whisky production. 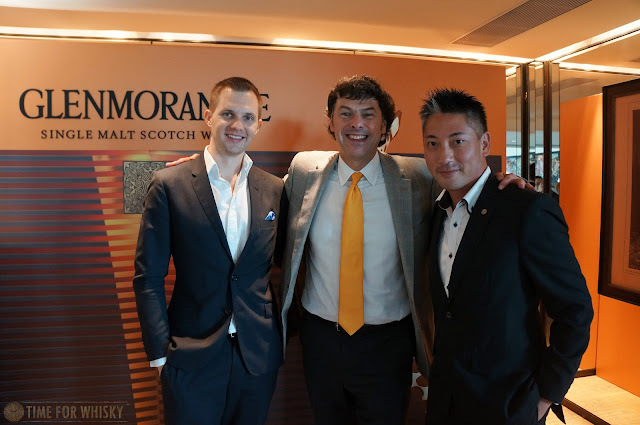 Dr Bill was very briefly in Hong Kong before embarking on a broader Asian tour, and took time to present to media and whisky fans at Hong Kong's Sevva, where he presented four Glenmorangie expression matched to five stunning courses. The lunch was not to launch or promote any one specific Glenmorangie expression, but rather to celebrate them all, with a careful selection including Glenmorangie Original (10yo), Glenmorangie 18yo, Glenmorangie 25yo and Glenmorangie Signet. 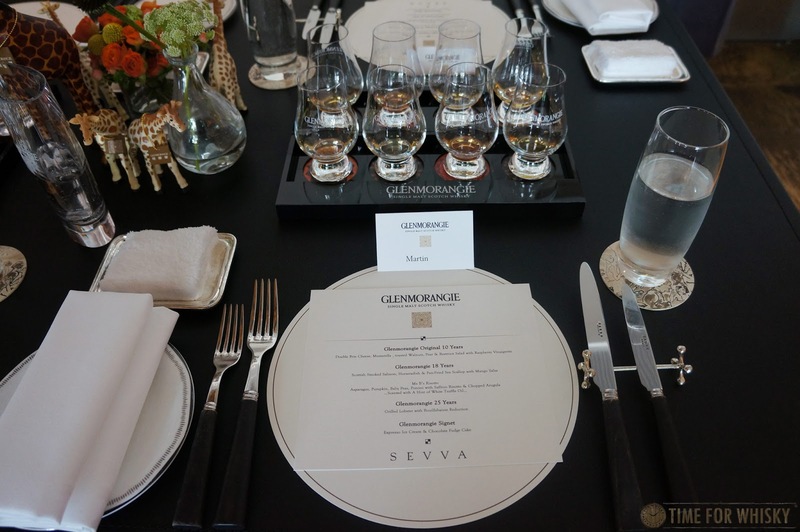 After a brief cocktail on Sevva's stunning terrace (a simple lemonade, Glenmorangie Original and ice, which was extremely welcome on a hot Hong Kong Summer's day) it was time to take our seats and hear from the good Doctor. After first explaining the (many) giraffes placed around the room (a reflection of Glenmorangie's unique long-necked still design), Dr Bill opened with a few jokes, an insight into his drinking habits (preferring younger whiskies generally, and typically drinking Glenmorangie Original despite "being able to fill a bathtub with 25yo" if he wanted) and then introduced us to the first course and its whisky pairing - Glenmorangie "The Original" 10yo (40%). 1st Course: Double Brie Cheese, Mozzarella, toasted walnuts, pear & beetroot salad with raspberry vinaigrette. 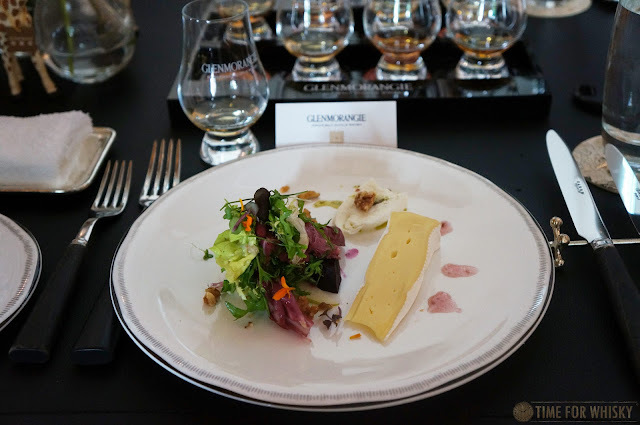 The simple (but deliciously fresh) cheese and salad plate paired well with the 10yo Original, with the delicate floral notes of the latter pairing surprisingly well with the robust cheese and nutty flavours of the former. Being seated right next to Bill (along with good mate Eddie of Barrel Concepts) gave us a great opportunity to chat - about Glenmorangie, Ardbeg, Ardbeg's recent space experiment, wood finishes, the popularity of Japanese whisky, ageing, barley varieties, rugby and golf. Oh, and about a little experiment Dr Bill is in the middle of, involving Ardbeg aged in Russian Oak. Although coy on the details (when asked for his thoughts on the impact Russian Oak has on the spirit, he said to ask again in 2 years), Dr Bill did suggest that the project (codenamed "Ardbeg KGB" within the distillery), could well be a future Ardbeg Day release. We've seen "Islalympics" (2012), Archaelogy (2013), Soccer World Cup (2014) and Space (2015) as themes, so can we expect to see a Russian-themed Ardbeg Day in the near future? Perhaps. If so....you heard it here first! Next up was the Glenmorangie 18 year old (43%), which sees ageing in ex-Bourbon casks first, with 1/3 of the whisky spending its final 3 years in Oloroso sherry casks. The "Chanel No.5" of whisky, as Dr Bill put it, with lemon, honeysuckle and (to our palate) some raisins and red grapes. 3rd Course: Ms B's Risotto: Asparagus, pumpkin, baby peas, porcini with saffron risotto & chopped arugula, scented with a hint of white truffle oil. 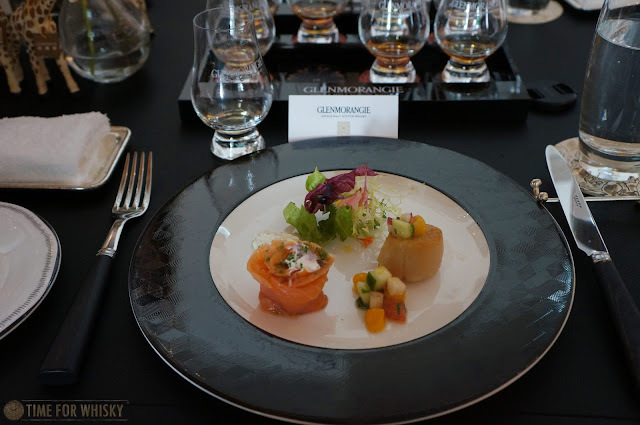 The 18 year old paired well with both dishes, especially with the salmon, where the honeysuckle and lemon notes played off brilliantly (salmon and whisky is always a good match, we find). 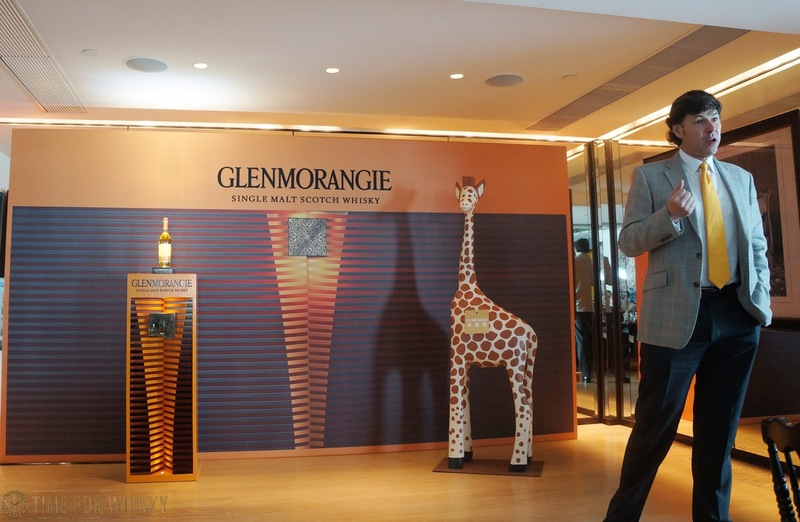 Next was the "grandfather" Glenmorangie 25 year old (43%), of which Dr Bill only makes 500 cases per year, and describes as "very difficult". Initially made as a one-off in 2001 (for the Taiwanese market), demand in Asia grew to the point where it became a world-wide, core part of the lineup. Dr Bill admitted it can be "inconsistent", but previous awards, including Best 15+ year old Single Malt Scotch in recent years have cemented its place as an extremely good dram. The whisky starts life in ex-Bourbon barrels, where it remains for ~20 years, before 25% is moved into sherry casks, and 25% into French red wine casks. You get the feeling that Dr Bill loves to play around with casks, finishes and ratios, and trust us, that's a good thing for whisky drinkers the world over! 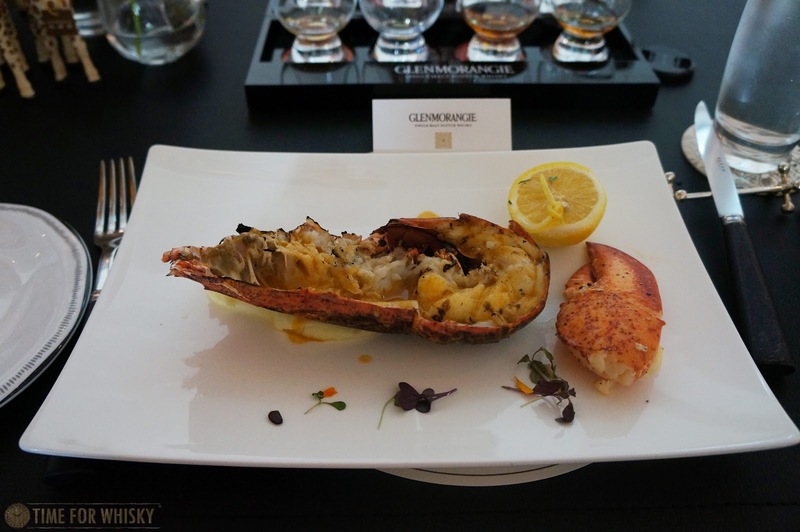 The 25 year old was another good pairing, adding a spiciness, nuttiness and even juiciness that wasn't present when eating the lobster on its own. Definitely one of those pairings where the whisky enhances the food. 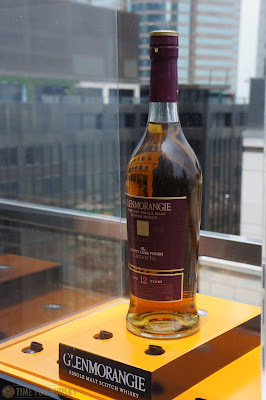 The final dram of the day was the Glenmorangie Signet (46%). Signet, which we tasted way back in the year it was unveiled - 2008 (at the Scotch Whisky Experience in Edinburgh) is clearly a passion project for Dr Bill, who called it the "biggest challenge of his career", with origins going back to the 90s. Using barley roasted like coffee beans ('high roast chocolate malt'), Dr Bill said he worked on Signet in secret for years, with the only giveaway being that "the distillery smelled like a Starbucks". Aged for 12-13 years, Dr Bill felt it didn't reflect the Glenmorangie style enough, so he set about seeing what could be added to bring the vision to life. A dressing of 35-45 year old Glenmorangie. Wow - only Dr Bill could come up with something like that. Actually, that's not true, but to produce something like that and make it taste as fantastic as it does - that takes skill like Dr Bill's. 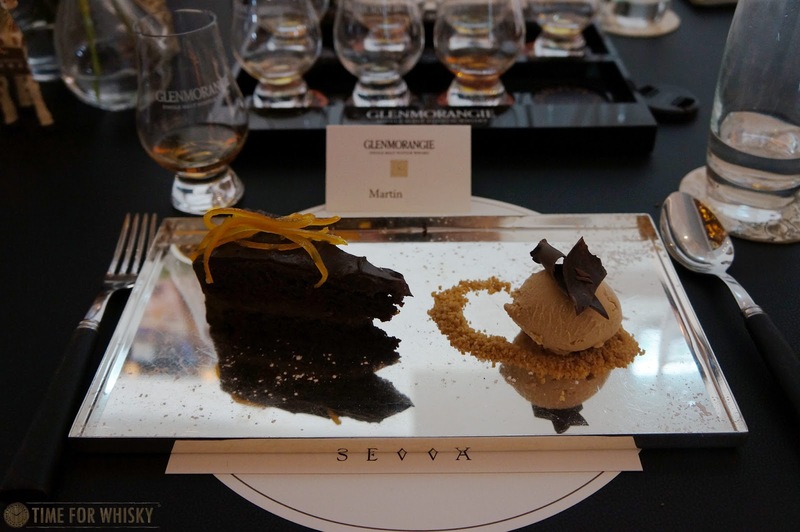 It can be easy (or easier) to match whisky with dessert, but regardless, this was the highlight pairing of the day, with the rich mocha notes of the Signet matching perfectly with the espresso ice cream and chocolate orange cake (with candied orange rind on top). A fantastic end to a brilliant lunch, having met one of Scotland's true whisky visionaries (who also just happens to be a really top bloke). TimeforWhisky.com would like to say a huge thanks to Dr Bill for his time, and to MHDHK for the invitation. Steph and I recently returned from a 3.5 week world trip, taking in (amongst other places) Scotland and the US. On a similar trip with my dad in 2009, I'd stumbled across a great little bar in New York City's Tribeca, Brandy Library, and was impressed with both their selection of whiskies and the friendliness (and knowledge) of the staff, not to mention their unique decor - very much a "library" of spirits. Fast forward to 2015, and it turns out not only is Brandy Library still thriving, it also now boasts the the very capable, very knowledgable Marlon. Marlon (a good friend) previously lived in Hong Kong (where he ran The Whisky Library) and prior to that, Singapore (where he manned the bar at The (old) Auld Alliance). 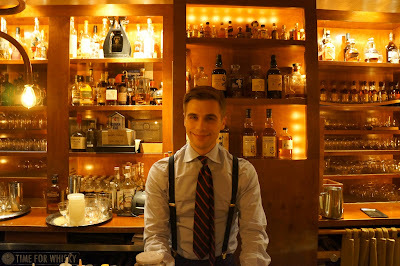 Quite the International man of whisk(e)y. Marlon moved to NY recently and it was great to catch up and share a few drams, and re-visit a favourite New York whisk(e)y bar. Located in the heart of Tribeca (and literally across the road from the Ghostbusters Fire Station), Brandy Library is an intimate space offering a variety of spirits, but with a large focus on both brandy and whisk(e)y. 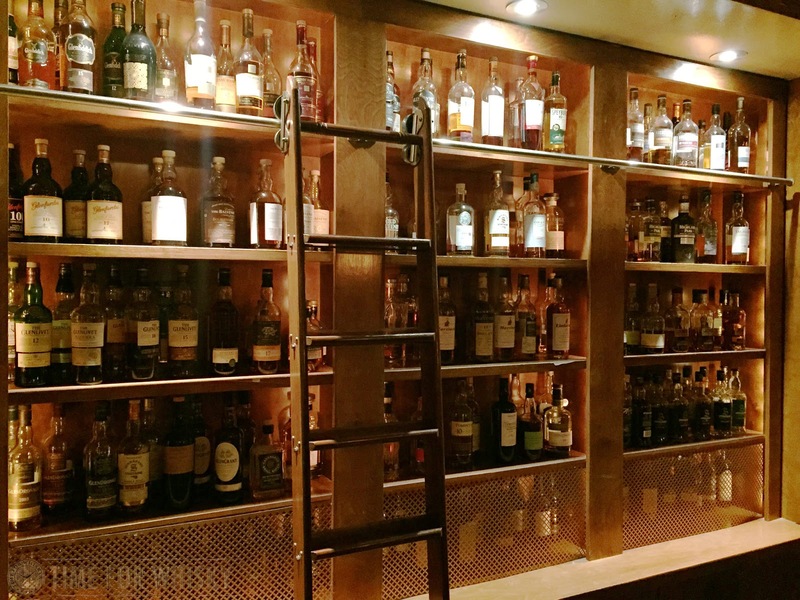 The whiskey focus here is definitely American, but with an enviable selection of Scotch, Japanese and other whiskies, and an especially impressive selection of miniatures on display. 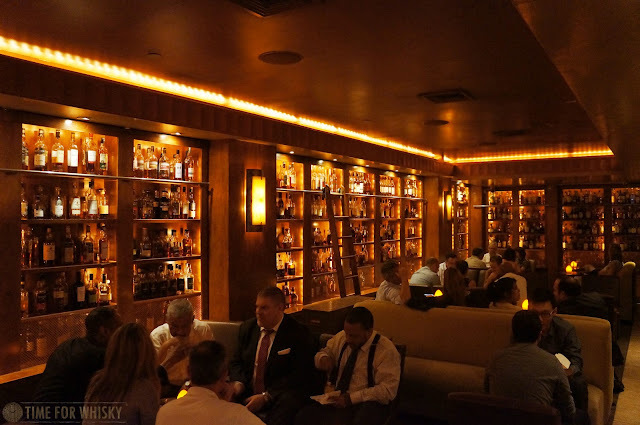 Most bars have the majority of spirits behind the bar, perhaps another cabinet or two for particularly well-stocked bars, and maybe (in the cases of bars like Sydney's The Baxter Inn, or Sydney/Melbourne's Eau de Vie) a separate room. 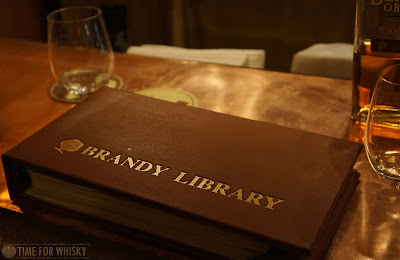 At Brandy Library though, the spirits envelope the room, with the walls quite literally covered in rare bottles (and ladders for those hard-to-reach bottles, emphasising the "Library" aspect). So...with an incredible selection of spirits from around the globe, where to start? 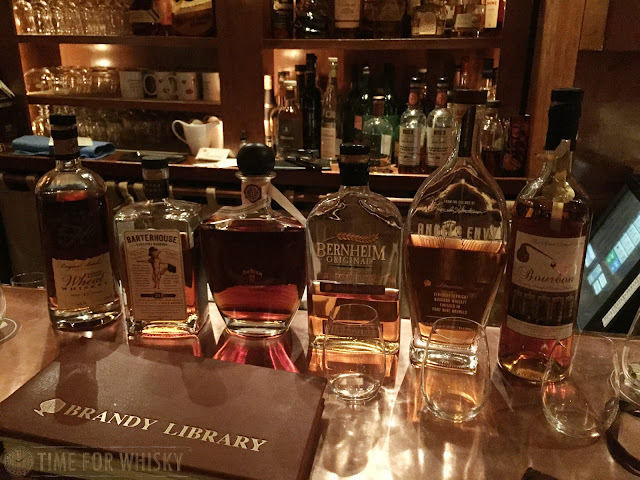 Well we'd spent our time on this trip in Japan and Scotland already, so I figured it was time to really explore some American whiskies. Marlon was quick to suggest a custom "Librarian's Craft" flight, and who was I to argue? Nose: Marmalade, cloves and some oaky spice. A little pepper. Palate: More marmalade but even more spice and oak. Thin on the palate, but with a citrusy sweetness that makes it enjoyable to drink neat. Not overly complex and not likely to knock anyone's socks off, but a very sippable, enjoyable dram. Finish: Short to medium, some oats. Nose: Sweet, rich berries. Not that far from a decent, somewhat sherried Scotch. Palate: Roasted hazelnuts, spicy vanilla, and some toffee. A bourbon, yes, but a richer, more rounded one. Some raspberries round out the enjoyable if not overly complex palate. Finish: Short and spicy - none of the port influence evidence on the nose or palate. This was is an interesting one. 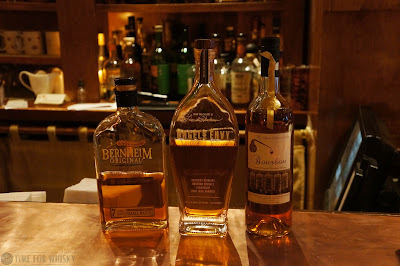 The label states both "Kentucky Straight Bourbon Whisky" and "Hand-bottled exclusively for Brandy Library by Prichards Distillery, Kelso Tennessee". A little digging reveals that whilst Prichards make much of their own whisky (and rum), this particular spirit is someone else's Bourbon (distillery unknown), and I believe has been re-barrelled for a time at Prichards in Tennessee before bottling. Nose: Paprika and oak tempered with sweet, velvety caramel and burnt demerara sugar. Palate: Huge spice, but herbal, vegetal. Creamy and syrupy mouthfeel. Finish: Long with some sound cream and chives! Not expected, but welcome. Rating (on my very non-scientific scale): 92/100. Who cares where it comes from, it's good whiskey! There's been much written about Diageo's well (over?) hyped "Orhan Barrel" series, but the one line version is: Diageo "uncovered" a bunch of rare, old Bourbon casks at Stitzel-Weller in Louisville, Kentucky, and bottled them in Tullahoma, Tennessee (presumably at George Dickel). This is one of their first releases. Nose: Vanilla, toffee, some sugar but with orange peels and grapefruit. Palate: Very spicy - could be confused for a rye, it it wasn't for the overwhelming sweetness - marshmallow, vanilla toffee and still some citrus notes, again, orange peels. Finish: Medium length, spicy. Warming but slightly hot at the very end. Nose: Creamy pecan and pumpkin pie, without any cream or sugary sweetness. Palate: Huge. Hot, spicy, almost no sweetness, but a touch of rich vanilla and sour lemon at the end. Finish: Sour and hot, and very long. Sour to the very end. Now this was a surprise. I knew Jim Beam made a few rarer / older expressions (and I knew they were better than regular Jim Beam White Label, of course), but this was a huge delight. 10-12yo Jim Beam finished in PX Sherry Casks, bottled at 50% ABV? They even sold it at Dan's for a time! Nose: Sweet American cherry (you know that flavour that's in everything? Yeah, a hint of that). Very, very sweet, but certainly not unpleasant. Palate: Maple syrup, cherries, hints of oak and a touch of rye spiciness. Incredibly smooth throughout. Balancing that fine line between sweetness and spice, and managing to be incredibly smooth without feeling "thin" or watered-down. Finish: Medium length with lots of red berries. Rating (on my very non-scientific scale): 92/100. A winner. A bourbon I'd consider buying, even. Go say hi to Marlon and the gang, and try some of the most interesting American whiskies you're likely to come across. The last suggestion certainly resonated and timed well, with the final season of Mad Men having been aired in May this year. In fact, "The Original 1963" is an expression that had been intended to reflect the original Glenfiddich single malt expression (known as 'straight malt' in the 1960s) and it was fairly new and most likely unheard of in the earlier 'Mad Men' / Don Draper days. During the 'Mad Men' era, between the 1960s and 1970s, blended whiskies were far more popular than their single malt whiskiy counterparts. Thus when Sandy Grant Gordon, the great grandson of William Grant first promoted Glenfiddich (or perhaps the entire single malt category) in 1963 outside Scotland, he had most likely set a catalyst for the single malt whisky category as a whole. The reincarnation of Glenfiddich's straight malt, labelled as 'The Original 1963' was the handiwork of Glenfiddich Head Distiller, Brian Kinsman. The reincarnation involved the sampling of the original straight malt from 1963 and the following of the original archived recipe. A clean, youthful Glenfiddich that takes its profile from the use of both ex-sherry and ex-bourbon barrels. The flavour profile is true to Glenfiddich though slightly more delicate. If this is anything like the straight malt introduced by Sandy in 1963, then I would have returned the Canadian Club blended whisky back to the cupboard and spend the rest of the night with this lovely dram. Nose: What is Glenfiddich without the Glenfiddich pear? Then there are notes of baked apples, vanilla and fresh spring flowers. There is also some biscuit note in there. Palate: The nose translates well to the palate. Though the palate is young yet buttery (especially when compared to the core Glenfiddich expressions - 12, 15, 18). The pear is there, honeyed pear perhaps, complemented with an overlay of vanilla and popcorn? Youthful yet refreshing. Finish: The finish is slowly drying with gentle lingering spices. Nose: Definitely some classic 'fiddich notes, but a lot more sherry than you expect on a regular 'fiddich expression. Lots of raisins too, but with an overarching freshness. Palate: Creamy, smooth and silky. Very drinkable. Cereal, oats, sweet vanilla icecream along with honey. A little bit of breakfast (honey-covered oats) with dessert (sweet vanilla icecream) all in one. Finish: Short to medium, sweet and spicey, with some milk chocolate at the end. ..but also because of their interesting use of different finishes. With their core lineup consisting of whisky finished in Flor de Caña rum casks, Sauternes casks, Californian cab sauv casks, and the new (to Australia) Single Malt which receives finishing in five different wine casks, this isn't your ordinary distillery pumping out nothing but Bourbon and Sherry-aged stock. Now, fancy finishes are all well and good, but they really only matter if the end product is good...and with Teeling, it really is. Their Single Grain is a whiskey I'd happily sip every day, and costs a meager $59.90AUD (not yet available in HK, though that may well change soon). Their "Small Batch" (which we first tried back in 2013) is probably one of the best value whiskies you can find for $52.99AUD, and their 21 year old single malt, well....wow. See our thoughts below. 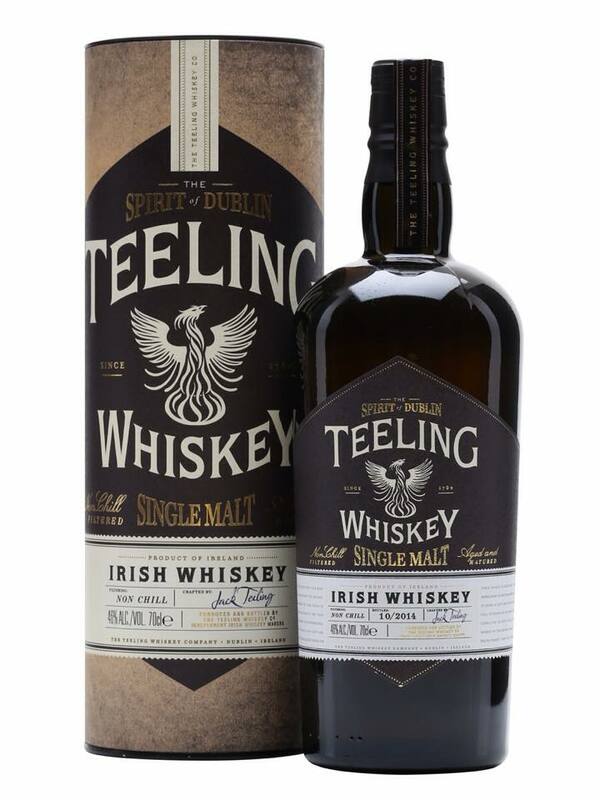 A trade launch was held in Australia on Monday night, coinciding with the Australian launch of the 21yo ($199.99AUD) and the Single Malt ($79.99AUD). They join the Small Batch and Single Grain which we've previously tried (here and here). 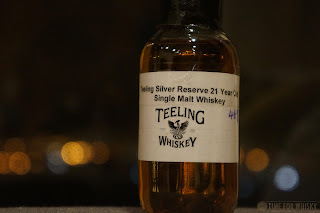 So what makes the Single Malt and 21yo so interesting? As mentioned above, the Single Malt is finished in 5 different wine casks (Sherry, Port, Madeira, White Burgundy and Cabernet Sauvignon) and despite being an NAS whiskey, features malt barrelled in 1991. Nose: Rich and fruity. Some lighter sherry-style notes (Christmas cake, raisings), but also some fresh grapes and even some strawberries. Palate: Slight citrus zest at first, quickly developing into a bold, almost meaty palate. Definite berries on the palate too - raspberries I'd say. Finish: Medium to long, with sweet red berries, fruit cake and a hint of masala-chai. Nose: Massive fruity bouquet. Tropical notes - passionfruit, some cashew, caramel sauce and pineapple sorbet. Palate: Fruit but with a hint of spice. Sweet pineapple runs throughout, with a moreish nuttiness initially, leading into stronger, spicier notes - almost Tobasco-sauce like. Finish: Long, lush and sweet. The tropical fruitiness lingers, and is accompanied by some whipped cream at the very end. Rating (on my very non-scientific scale): 94/100. In one sentence: "Like a Hawaiian pizza with a hint of Tobasco sauce, followed up by a tropical fruit salad for dessert. Magic." 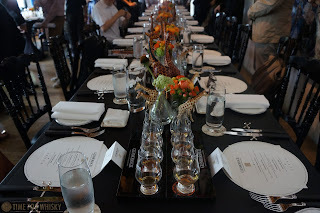 It's hard to believe it's been almost 2 years since we attended the Australian launch of Macallan 1824 series, but hey, time flies when you're having fun and drinking whisky. "Rare Cask is the very embodiment of The Macallan’s commitment to exceptional wood management. Crafted from the desire to showcase complexity and depth, Rare Cask comes from the broadest spectrum of casks, 16 different profiles, ever identified by the Master Whisky Maker and from the most extensive range of cooperages in Spain. In celebration of the launch of The Macallan Rare Cask in Asia, The Macallan hosted a series of events including press conference, media interviews, exclusive tastings and a VIP dinner from Tuesday 7th July 2015 to Friday 10th July 2015 at Central Plaza, Hong Kong. With participation of over hundreds of sophisticated overseas guests and media, key opinion leaders, whisky connoisseurs and collectors to attend this regional launch event, The Macallan invites guests to savour one of the latest addition to their range of finest whiskies. For this special occasion, The Macallan selected a repertoire of its most representative expressions for discerning spirit enthusiasts to appreciate. Mr. David Cox, Director of Fine & Rare Whiskies presented the four exquisite styles of whisky and hosted the unveiling ceremony of The Macallan Rare Cask. Rare Cask is meticulously created by our Master Whisky Maker from a small proportion of maturing casks at The Macallan distillery. These casks are handmade from Spanish and American oak; and are the best in the business. Wood defines the flavour of The Macallan, with over 60% of the character comes from the cask it is aged in. But as the name suggests, there is more to this story. Rare Cask is truly rare. This rarity comes from the fact that some of the casks used in the creation of this whisky will never be used again. 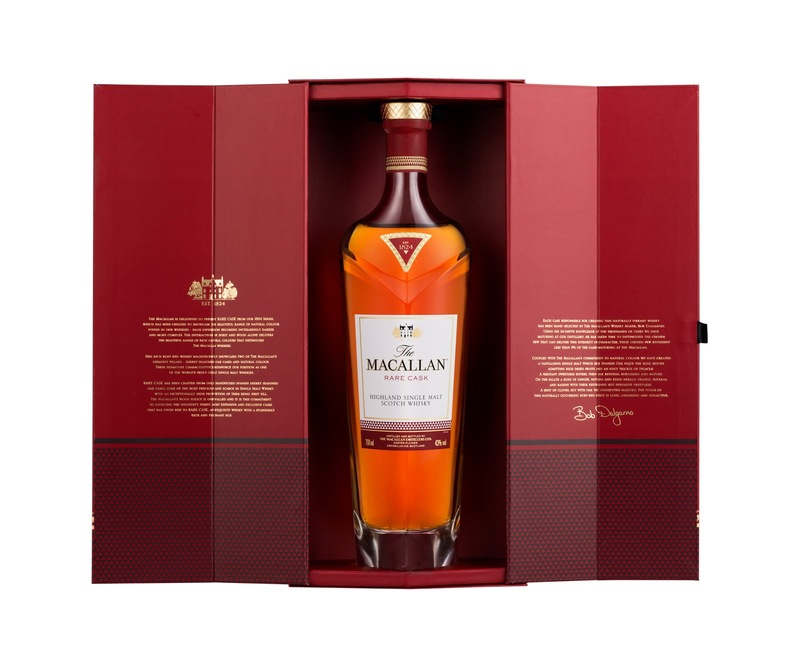 With a rich mahogany red hue, The Macallan Rare Cask showcases two of The Macallan’s greatest strengths, exceptional oak casks and natural colour, which are combined with knowledge, skill, passion, commitment and creativity. A whisky produced through meticulous dedication to wood." The line "This rarity comes from the fact that some of the casks used in the creation of this whisky will never be used again" suggests the casks used could be third (or even fourth?) fill casks, but that's unlikely to be the case given the rich dark colour on this release (keeping in mind The Macallan use no caramel colouring in this whisky). Whatever the composition, from all reports this is another high-quality NAS release from The Macallan, and seems to be carrying quite a bit of age too. We hope to have tasting notes up soon. Being big fans of William Grant & Sons on this blog, we can't say we were overly surprised at this news, but it's still nice to see the (still) family-owned company kicking goals, with a whopping 53 medals awarded at this year's ISC (not to mention winning two categories outright). "William Grant & Sons, was awarded the highly prestigious Scotch Whisky Producer of the Year at the International Spirits Challenge (ISC) awards which took place at The Honorable Artillery Company, London." In the individual product honours, Monkey Shoulder won best Scotch Malt Whisky aged up to 20 years and Glenfiddich 21 Year Old won best Scotch Malt Whisky 21 years or over. This was in addition to the 53 gold, silver & bronze medals awarded to William Grant & Sons brands this year. The International Spirits Challenge is one of the most authoritative, respected and influential spirits competitions in the world. 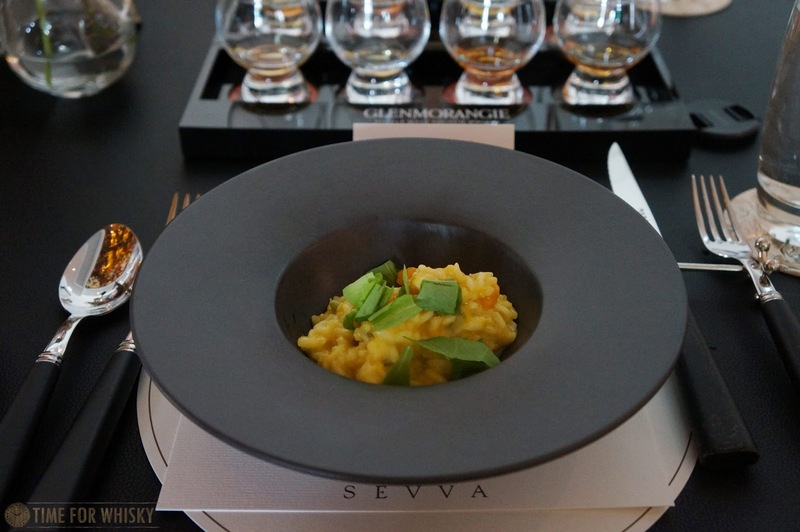 The competition is founded on a rigorous and independent judging process, which serves to encourage the high calibre of spirits entered into the competition each year. Receiving more than 1,000 entries from nearly 70 countries worldwide, the ISC is a truly global competition." Whilst not the first to send whisky into space, Suntory is certainly the latest to experiment with the “development of mellowness in alcoholic beverages through the use of a microgravity environment” (or "sending whisky into space"). Further details can be found in the press release below. "Suntory Global Innovation Center is about to embark upon space experiments on the “development of mellowness in alcoholic beverages through the use of a microgravity environment.” This research will be conducted in the International Space Station’s Japanese Experiment Module (nicknamed “Kibo”), with the cooperation of the Japan Aerospace Exploration Agency (JAXA). H-II Transfer Vehicle No. 5, commonly known as “Kounotori5” or HTV5, is scheduled to be launched from JAXA’s Tanegashima Space Center on August 16 (Sunday) carrying alcohol beverages produced by Suntory to the Japanese Experiment Module aboard the International Space Station, where experiments on the “development of mellowness” will be conducted for a period of about one year in Group 1 and for two or more years (undecided) in Group 2. With the exception of some items like beer, alcoholic beverages are widely known to develop a mellow flavor when aged for a long time. Although researchers have taken a variety of scientific approaches to elucidating the underlying mechanism, we still do not have a full picture of how this occurs. Our company has hypothesized that “the formation of high-dimensional molecular structure consisting of water, ethanol, and other ingredients in alcoholic beverages contributes to the development of mellowness,” and we have been conducting collaborative researches on this topic with research groups of Professor Shigenao Maruyama of the Institute of Fluid Science, Tohoku University and Professor Mitsuhiro Shibayama of the Institute for Solid State Physics, the University of Tokyo, the Japan Synchrotron Radiation Research Institute and Suntory Foundation for Life Sciences. The results of these collaborative researches have suggested the probability that mellowness develops by promoted formation of the high-dimensional molecular structure in the alcoholic beverage in environments where liquid convection is suppressed. On the basis of these results, the space experiments will be conducted to verify the effect of the convection-free state created by a microgravity environment to the mellowing of alcoholic beverage. One set of samples consisting of various alcoholic beverages will be stored in a convection-free state in Japanese Experiment Module “Kibo” on the International Space Station, and another set of the identical samples will be stored in Japan for the same period of time. Five types of distilled spirits differing aging periods and 40% ethanol: Total of six samples"
Anyone who's travelled through an airport in 2015 will have likely seen an unusual, distinctive blue bottle that looks just a little too big to be a fragrance bottle. It's not, of course - and as most of you would know, it's Diageo's "Haig Club", a single grain whisky promoted heavily by David Beckham. Whilst the bottle and association with Becks might be new, the Haig brand, and the Cameronbridge distillery in Fife where the whisky is distilled, have ties back to the 17th century. "The contemporary appearance of the square HAIG CLUB™ bottle draws on a history of innovative bottles produced by the House of Haig. The blue glass bottle was inspired by the tradition of blenders using blue tasting glasses so the spirit can be reviewed on aroma and taste alone. The unique flavours of the whisky itself are created by master blender Chris Clark carefully selecting mature whisky from Refill, American Oak and Rejuvenated casks producing a stunning Single Grain Scotch Whisky with a fresh, clean style showcasing butterscotch-smooth tropical fruit and unexpected, spicy backing harmonies. HAIG CLUB™ is a whisky crafted to appeal to people who are new to whisky and whisky connoisseurs alike. “I am incredibly proud to have been part of the creation of HAIG CLUB™,” said David Beckham. “I think we have made something really special. For me it has meant understanding how whisky is made and enjoyed and then working with some incredible people to write a new chapter for Haig. To celebrate the Hong Kong launch of HAIG CLUB™, a cocktail reception was held in The Envoy, a bespoke cocktail bar on 23 July, hosted by Marketing Director Drew Mills. 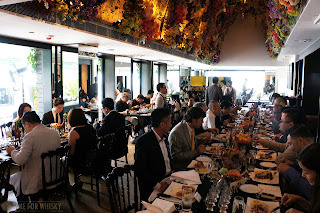 Trade partners and media friends were presented HAIG CLUB™ neat, paired with food, and in four cocktails tailor-made by newly crowned Diageo World Class Hong Kong Champion, Antonio Lai. Antonio’s curated cocktails list captures the delicate flavours of HAIG CLUB™, showcasing the versatility and accessibility of the liquid. 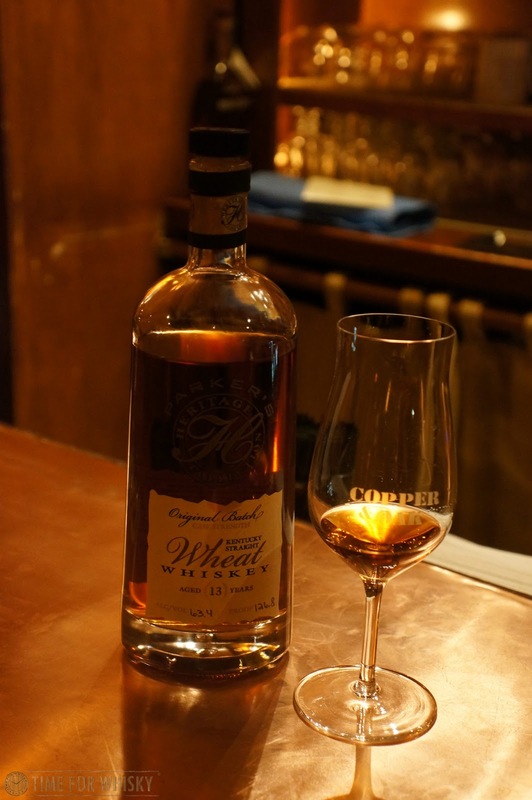 Great to see some more widespread recognition for single grain whisky (although we still think it looks a little bit like a perfume bottle...). Glenfiddich are running a competition in Australia at the moment, looking to find Australia's most original business. One of the five semi-finalists will be selected shortly. 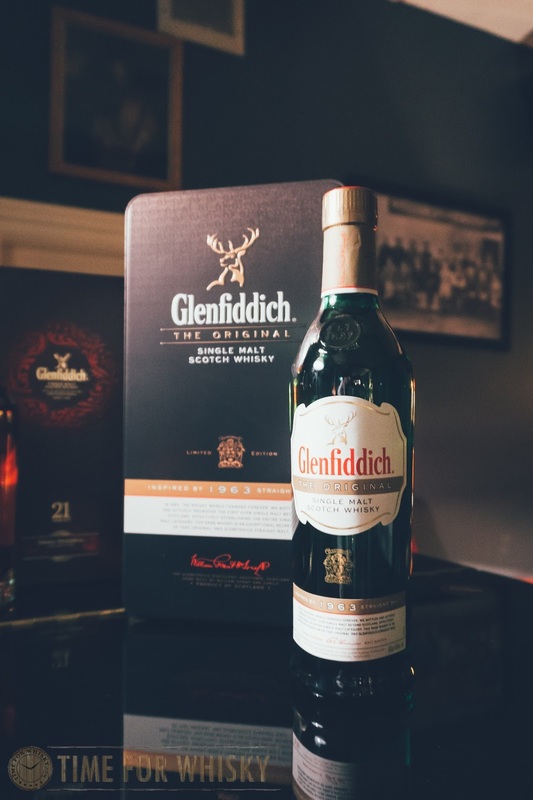 "Iconic whisky brand Glenfiddich is excited to announce the finalists of The Original Grant competition in its nation-wide search for Australia’s most original small to medium sized business (SME). 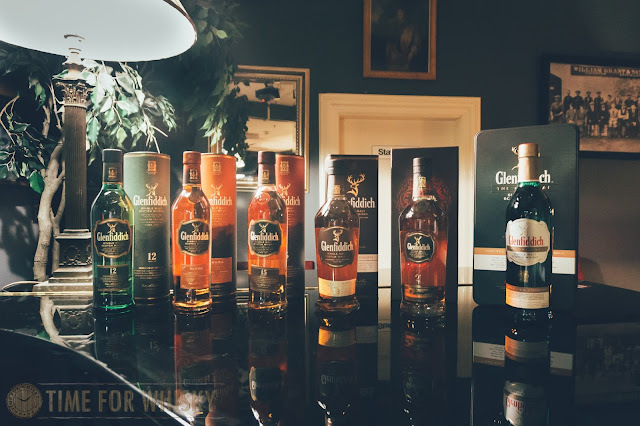 The competition was inspired by the June 2015 launch of ‘Glenfiddich The Original’, an exclusive re-creation of the original 1963 Glenfiddich Straight Malt, which was the first ever single malt to be released worldwide. Since its creation, the family-run Glenfiddich Distillery has become synonymous with pioneering spirit. William Grant even carefully selected each of his 7 sons’ professions to ensure they mastered a specific skill to build the business into what it is today. After five generations, the legacy of William Grant & Sons lives on as the traditional techniques of production and underlying values have been passed down to each successor, playing a significant part in the company’s global success. 1. Oscar Razor is the only father-daughter-run shaving subscription service in the country. Offering German-made razor blades, the business is resolute in its commitment to quality, cost, and convenience. 2. 100% Australian owned, Naturally Wild provides naturally raised, hormone free and naturally fed game meats from Outback Australia. 3. The Whisky Order takes previously out of reach whisky malts and makes them available to whisky-lovers without committing to the purchase of a full bottle. 4. Work Club is a Sydney based co-working office that brings businesses together in the same space, driven by the idea that by surrounding yourself with like minded entrepreneurs, creative sparks will fly and help to improve your business. 5. Specialising in premium spirits, local liquor store Sea Breeze Cellars not only carries over 800 spirits but sells rare and collectible items. In early August, Glenfiddich will announce the winning business that best exemplifies William’s unwavering passion and innovation that still continues to drive the business today. The winning organisation will receive invaluable business advice from Dan Gregory, a Behaviour Researcher and Strategist and regular panellist on ABC TV’s The Gruen Transfer, and business partner Kieran Flanagan at The Impossible Institute, valued at $15,000. The yearlong ‘Stones for David’ program helps small businesses to punch above their weight and grow their brand in a category disruptive way. 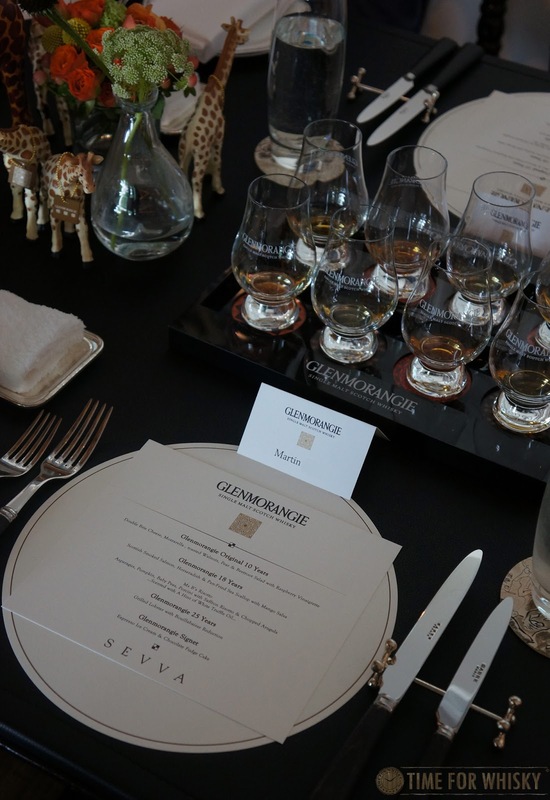 William Grant & Sons will also reward the winner with a ‘Glenfiddich The Original’ tasting kit and a whisky specialist to host an exclusive celebration with staff and guests, valued at $1,500. For more information on the finalists visit: http://www.glenfiddich.com/au/explore/the-original-grant/"
"On Tuesday 1 September, arriving in Sydney for the first time all together will be Fred Noe, seventh generation Master Distiller of Jim Beam, John Campbell, Distillery Manager of the legendary Laphroaig Islay malt distillery, Dan Tullio representing Canadian Club, and Hiroyoshi (Mike) Miyamoto, Global Brand Ambassador for Suntory Whisky of Japan. These whisk(e)y experts will be coming together in Australia to debate a question for the ages… who makes the world’s best whisk(e)y? For centuries the answer was simple – it was the Scots, even though the Irish claimed it was their invention right back when the Celts ruled the world. Oh, for those days of the dram… But as with so many things in this hyper-connected, trends-driven, crazy new world, everything has turned on its head. Last year the world’s most authoritative whisk(e)y guide proclaimed that the Japanese were making the best in the world. 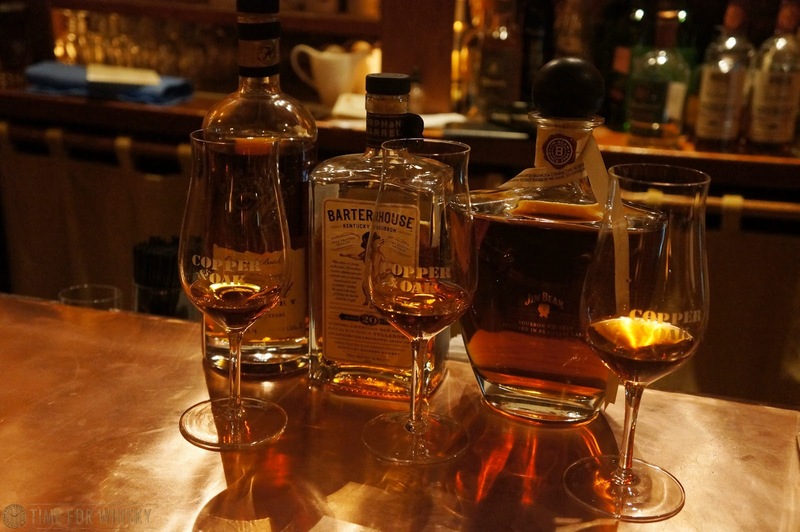 The Americans fought back with a whole new wave of high-end, single batches of bourbon and whiskey. The Canadians claimed (as they always do) that they actually do it better than the Americans, but the Americans just shouted about it more, and well the Scots are fighting back like Braveheart with a belly full of 15 year old Laphroaig and a tub of face paint. It’s a right proper whisk(e)y rumble. This September for the very first time in Australia, four of the world’s great whisk(e)y experts from four of the world’s great whisk(e)y brands will descend on Sydney to try to resolve the issue once and for all. Or, as is more likely to be the case, drink a lot, talk a lot, argue a bit and have an enormous amount of fun celebrating the great diversity of whisk(e)y in today’s world. It will be an epic showdown. After all, whisk(e)y is the world’s hottest spirit right now, and in Australia whisk(e)y growth is nothing short of a phenomenon. Fittingly, the four whisk(e)y greats come together in the same year the renowned Jim Murray “Whisky Bible 2015” named Yamazaki Single Malt Sherry Cask 2013 “Best Whisky in the World,” and the prestigious 2015 San Francisco World Spirits competition awarded Knob Creek “Best Bourbon” (overall). Meanwhile, the great Laphroaig from the island of Islay has just re-released its iconic 15 Year Old Single Malt to celebrate its 200th year of distilling. Anyone who thinks the Scots will go down without a fight hasn’t been to Scotland. “We’ve been distilling the world’s most richly flavoured Scotch Whisky for 200 years, so I look forward to teaching these newer whiskies a thing or two,” said John Campbell in anticipation of The Rumble. And Canadian Club? Well it just happens to be the fastest growing spirits trademark brand in Australia[i] - it is approachable, fun and delicious and, well let’s be honest… everyone likes the Canadians. 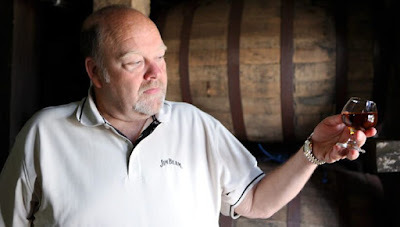 7th Generation Jim Beam Master Distiller Fred Noe is a legend, simple as that. And he can’t wait to show Aussies why Bourbon whiskey from Kentucky is the best. “The Rumble is the perfect setting to really hash out who has the best whiskey,” said Noe. “Whiskey is now produced all over the world, and each country has its own set of distillation rules as well as its own unique whiskey. There is no question that Bourbon whiskey from Kentucky is hands down the best.”"
September is approaching, and in the world of American whiskey, that can only mean one thing..."Jacktember". 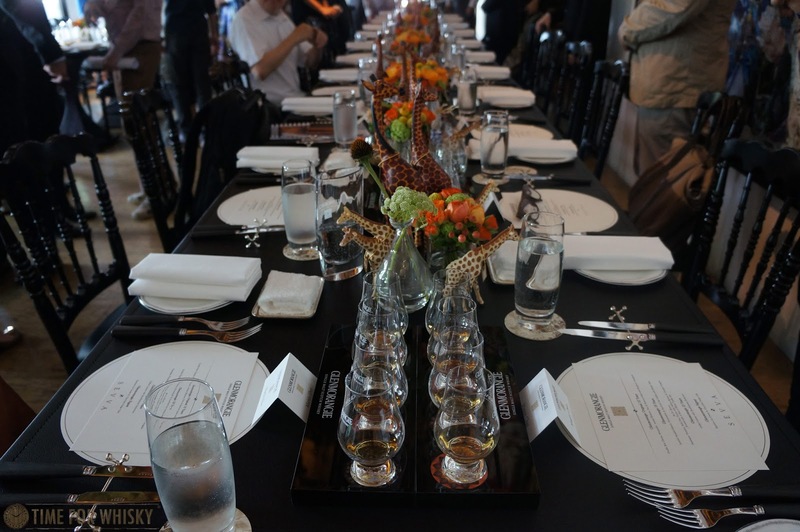 "September can mean only one thing for Jack Daniel's fans - the chance to celebrate the birthday of the legendary craftsmen whose name has become synonymous with whiskey lovers all over Australia. To mark the occasion, Jack Daniel's is toasting the great man with its biggest and most ambitious celebration yet - and it needs the help of Australians to bring it to life! Because no-one is sure of his exact date of birth, Jack's birthday is celebrated for the whole month of September, with events getting bigger and bigger every year. 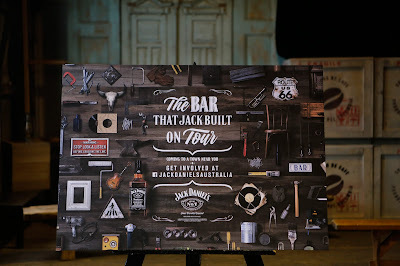 In 2014, Jack Daniel's created the world's first crowd-sourced bar in Sydney to celebrate Jack's birthday and honour his craftsmanship, style and uniqueness. This year, it's being taken to a whole new level with the creation of the world's first bar built on tour, completely crowd-sourced by fans. Supported by Mack Trucks Australia, Jack Daniel's will hit the road this Spring with a regional tour taking in six regional cities and towns across New South Wales and Victoria. Fans will be given the opportunity to join dedicated workshops in each town, build props and furniture for the bar or donate materials/items and make a contribution to the legend of Jack in their own way. Electricians, carpenters, joiners, technicians, finishers, artists, designers and regular Joes are all being sought to donate their time and expertise to turn the idea into reality. The reward? Whiskey! That’s right fans are literally working for Jack, not to mention a chance to get their hands on an invitation to celebrate Jack's birthday in style - in the very bar they have helped to build. "The Bar That Jack Built" will be open to the public in Sydney and Melbourne for two three-day Jack Daniel's birthday extravaganzas at the end of September - Federation Square, Melbourne from 18-20 September, and Parramatta Park, Sydney from 25-27 September. Marisa Murray, Senior Brand Manager, Jack Daniel’s added, “To celebrate the love that Australians have for Jack and the Jack Daniel's brand, stemming from the authenticity established by the man himself, we want to give as many fans as possible the chance to make his birthday an unforgettable occasion - that's why we're hitting the road! 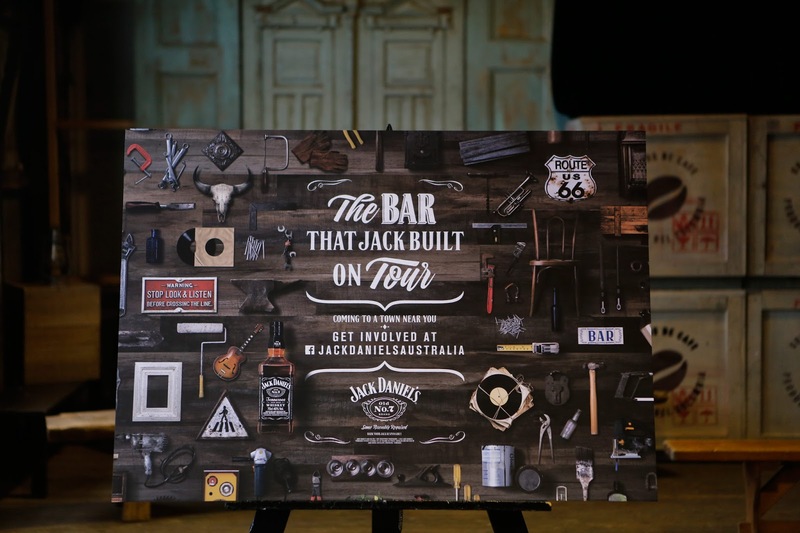 In addition to those who can help build the bar itself, Jack Daniel's is also looking for the hottest new bands, singers and entertainers that want to perform at Jack’s bar in Melbourne and Sydney. Of course they will be working for Jack too, in true crowd sourcing style. To get involved with the campaign and find out more information, head to https://www.facebook.com/JackDanielsAustralia."